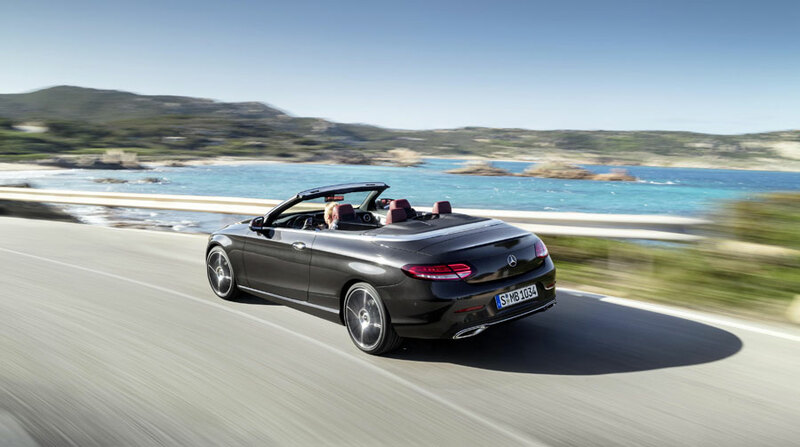 The two-door version of the Mercedes-Benz C-Class is enjoying its new form with the coupé and cabriolet. The coupé – launched at the end of 2015, and the cabriolet – available since the summer of 2016, address the heart and mind in equal measure. Now, a sharper design including a digital cockpit and sports suspension enhance the driving pleasure. Mercedes-Benz new four-cylinder engines highlight the dynamic nature of this appealing C-Class. The new C-Class combines emotion with intelligence. The vehicle’s appearance is defined in particular by its front and tail end and the design of the headlights and tail lights. The front design exudes sportiness and lifestyle at first glance. Powerful styling elements such as the new bumper and the standard-fit diamond radiator grille lend the two-door C-Class models an individual character. LED High Performance headlights are now standard and in their new design they have an especially distinctive appearance. Due to the autonomous design with the dynamic details and standard-fit two-pipe exhaust system (petrol engines) the rear view appears broad and agile with more accentuated all-LED rear lights. The new C-Class comes with extended Active Brake Assist as standard. Depending on the situation, this can help to mitigate the consequences of rear-end collisions with slow-moving, stopping or stationary vehicles ahead, and even with crossing pedestrians and cyclists, or prevent them altogether. The C-Class also uses map and navigation data for assistance functions and is able to give the driver map-based support in numerous situations, and predictively adjust the speed e.g. when approaching bends, junctions or roundabouts. Other new developments include intuitively understandable Active Lane Change Assist and Active Emergency Stop Assist as new functions of Active Steering Assist. The new coupé and cabriolet will go on sale in the UK in April 2018 and first deliveries will arrive in July.